Mar Bonnin-Palmer runs down the basics of planning a property inspection trip to check out likely French dream homes and explains the advantages of getting your budget sorted out beforehand. Before you even set foot in France, you’ll doubtless have already done extensive online research, looking for your ideal French property. If you’re already familiar with the region, you’ll know what to expect. If not, you can discover a great deal about the area and the style of properties for sale by looking through estate agents’ websites, using a service such as The French Property Finders and visiting exhibitions or seminars in the UK. Once you’ve narrowed your search area, book appointments to view the selected properties, through your property finder or direct with French estate agents. Arrange several days for your trip, avoiding public holidays. You may also need an extra day to go back and re-view your favourites. Unless you’re house hunting in a city, you’ll need a car to travel between viewings and if you’re looking in rural areas, be realistic about how many properties you can see in a day. Two to three is often the most you can fit in when the distances between them are large and you’re using winding country roads. Luxury homes tend to be large so allow plenty of time for those. Arrange your finances in advance. Even though the French property market is generally slightly down, prime properties are still in high demand from overseas buyers. Unless you’re a cash buyer, arrange a ‘mortgage in principle’ before your trip. French mortgage rates are currently at record lows, but still know your budget and don’t get ‘blown off course’ by a beautiful area and the warmer weather. A vital element of your budget is the exchange rate. Open an account with a currency specialist, such as Moneycorp, before you go. Not only does Moneycorp’s exchange rates beat the banks by up to 4% but also FrenchEntrée readers get free currency transfers for life. More importantly, you’ll be given a personal account manager who’ll advise you when’s the best time to buy Euros and explain the tools available. 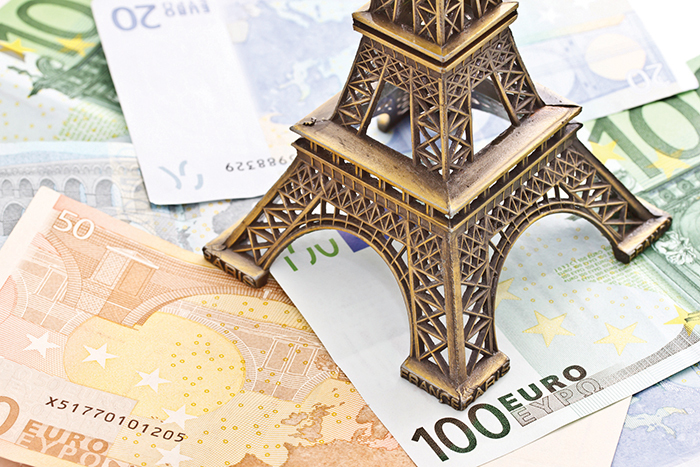 We saw an example of how volatility can affect buying budgets this January when the Euro rate fell drastically after the Swiss National Bank decided to remove its cap on the Euro. That day the Euro-Pound rate reached its best level in seven years and hundreds of buyers saw their budget increased by a couple of thousand pounds. You can buy currency with Moneycorp online 24/7 or deal over the phone with your account manager (7.30am-9pm Mon-Fri & 9am-1pm Sat). You can also fix the rate with our ‘Regular Payment Plan’, to pay bills and expenses once you’ve bought your new home. After your first currency transfer, you’ll be given a Starcard for discounted rates on holiday money. Your funds are safe with Moneycorp, the UK’s largest currency specialist. We’re authorised and regulated by the Financial Conduct Authority so your money is ring-fenced in a secure client account. It’s free to open an account with Moneycorp and there’s no obligation to use it. ● Mar Bonnin-Palmer, a Senior Key Account Manager at Moneycorp, is a foreign exchange expert who specialises in foreign exchange transfers for overseas property. For more information, please visit www.moneycorp.com or call +44 (0)20 7589 3000. Remember, if you mention FrenchEntrée magazine, you are entitled to FREE transfer fees on all of your currency payments.